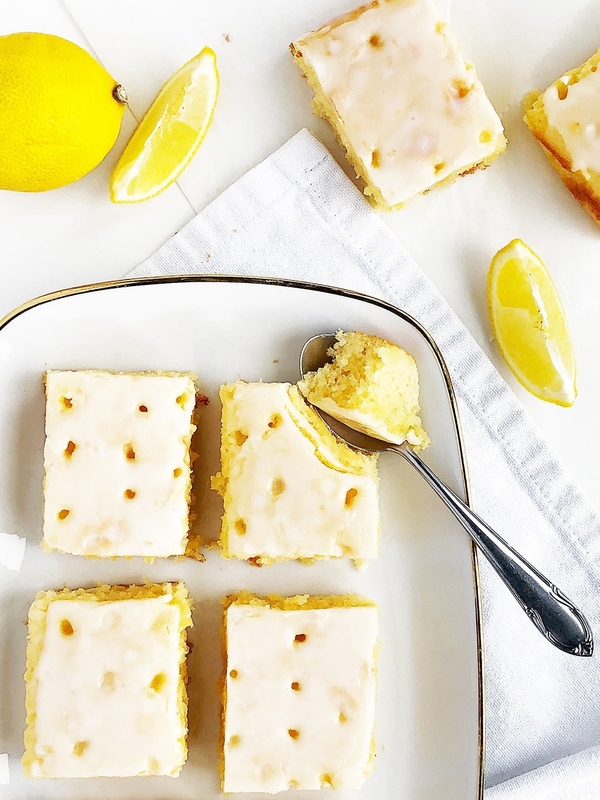 This easy lemon drizzle tray bake is light and moist with a sweet yet zingy taste. It’s a tea time classic and a perfect everyday cake that takes less than an hour to make. Leave all your refrigerated ingredients at room temperature for at least 30 minutes before baking. Line the tray with baking paper. Put all ingredients for the sponge into a large bowl. Beat the mixture with a hand mixer until smooth and creamy. Pour the mix onto the tray and spread evenly. Bake on 160°C around 25 – 30 minutes or until the testing tool comes out clean when inserted into the sponge. Prick little holes all over the sponge while it’s still hot with a skewer or chopstick (approx. 2 cm apart). Mix icing sugar with lemon juice and stir until the mixture is smooth and without lumps. 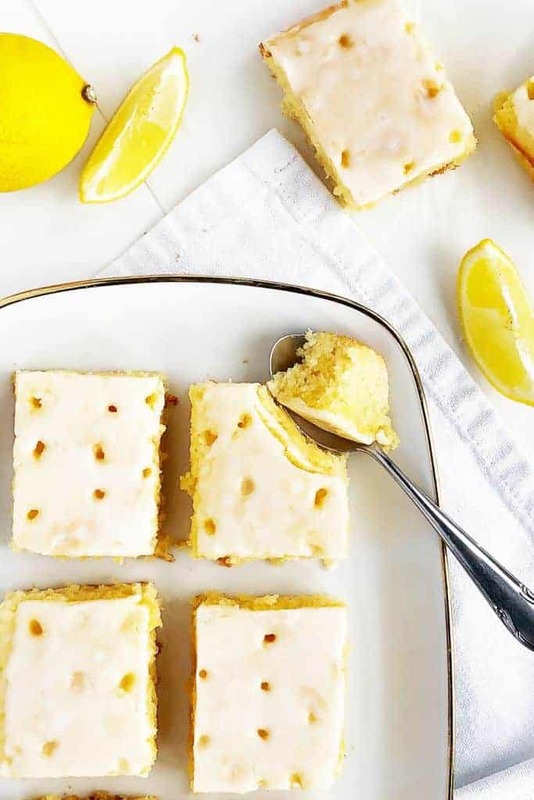 Spread the lemon drizzle icing across the surface of the sponge so it fills all the little holes. Make sure the cake is still pretty warm to be able to absorb the drizzle. Let it dry for 30 minutes before cutting. Tip: Always sift flour and sugar. It helps to get a smoother batter or icing. This is another quick and easy cake to make. I will never get bored with simple cakes as they are so handy and save so much time. 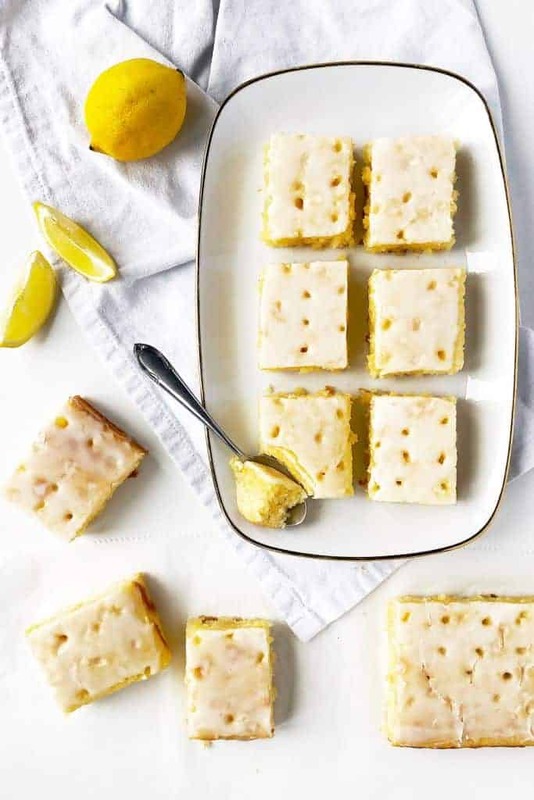 To make this tray bake, I got inspired by the lemons we had leftover from Shrove Tuesday (pancake day). The recipe was a complete risk with my boys as I never know what they will eat and what they refuse. A while ago when I made Broccoli and Stilton Soup I almost didn’t offer it to them assuming the cheese flavour was too strong but they tried it and to my surprise they loved it. This time I was lucky again. My boys enjoyed this tray bake. I know you think it’s not a big deal because kids generally love anything sweet but I can tell you my children can be complicated when it comes to food even the sweet variations. This is a triple lemon drizzle dessert as I added lemon in 3 different forms. There is grated lemon zest and 2 tablespoons of lemon curd in the sponge mixture and the lemon drizzle is made of icing sugar and lemon juice. This cake is light and moist and has a delicious sweet yet sharp lemony taste. The icing creates a lovely crisp layer at the top. Making the icing can’t be easier. Place icing sugar into a bowl and pour in lemon juice. Mix until smooth and without lumps. You can achieve different results depending on how much liquid you use. Be aware that a little goes a long way so if you don’t want the mix to be too runny, stir the lemon juice into the sugar in a few steps and stop adding more once you are happy with the consistency. If your lemon icing is too runny simply add more sugar. Runnier drizzle will give you a thin, glossy and slightly transparent crisp layer at the top. Thicker drizzle will create a nice thick white decorative layer. The cake temperature can make a difference too. Spread the sugar icing onto a still warm cake and it will get absorbed into the sponge better. You can help it even more by making small holes into the cake while it is hot before you pour the icing on. This cake is best to eat on the same day when it’s freshly made. It is a moist cake as the drizzle isn’t only spread over the top, it gets absorbed into the cake too. 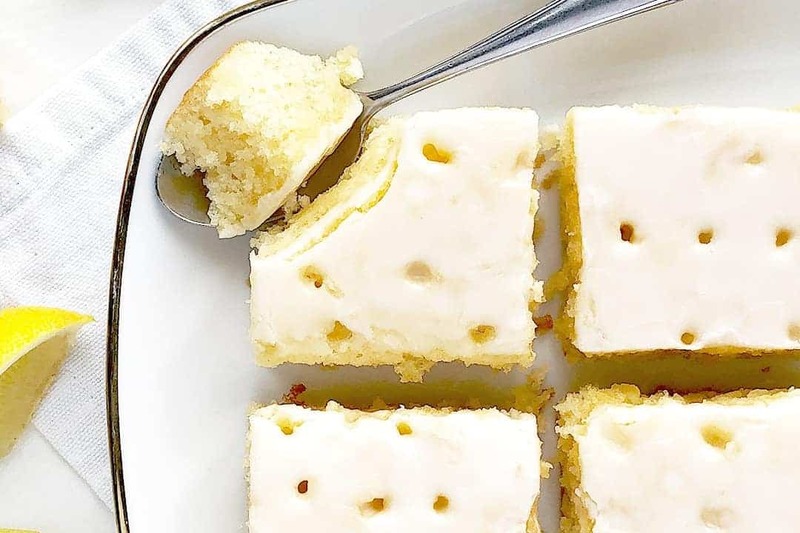 If you have some leftovers you can keep them in an airtight box at room temperature for up to 3 days but the cake will get slightly soggy because of all of that sugar drizzle. You can alternatively freeze the cake while it’s still fresh and slowly defrost it when you feel like having it. Welcome to our family food blog Allkitchencolours.co.uk. We love cooking and we cook a lot. Instead of using a traditional recipe book that would sit in our kitchen dresser we have decided to make our family recipe book digital. Hopefully, it means that now we won’t forget any of our tasty recipes ever again and it’s easy to share them with others. This website is all about our love for cooking and tasty food, as well as our enthusiasm for improving our home and lifestyle. More about us. All images and text on this site are our property. If you’d like to share, feel free to use an image from the article and link back to that post. Pinning is always welcome and appreciated. Lea is originally from the Czech Republic. 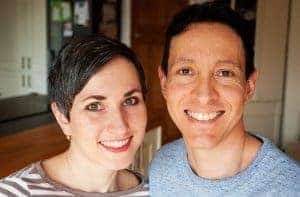 Before she decided to overcome her phobia of foreign languages (believe it or not, this phobia exists and it’s called xenoglossophobia) and move to the UK, she grew up and studied in the colourful Czech city Brno. After she got her degree in teaching (art and civics) at Masaryk University and 5 years of internship in one of the biggest art galleries in the Czech Republic, she decided to move to the UK long term. After a few first years working as an au-pair and studying hard to improve her English she found a job in SEO company as a brand analyst. To her surprise, she enjoyed all the technical aspects of the job and working with computers. The last 7 years, Lea is a stay at home mum, looking after her 2 sons. She still carries art in her heart but she is currently focusing on her blog and dreams about a successful job from home. An excellent, simple to make lemon drizzle loaf with poppy seeds, decorated with a thick layer of sugar topping. This lemon cake will definitely be a big hit! Thanks for sharing! Thanks so much Karly, happy you like it. Allkitchencolours.co.uk is a participant in the Amazon EU Associates Programme, an affiliate advertising programme designed to provide a means for sites to earn advertising fees by advertising and linking to Amazon.co.uk For further information please read our disclosure.